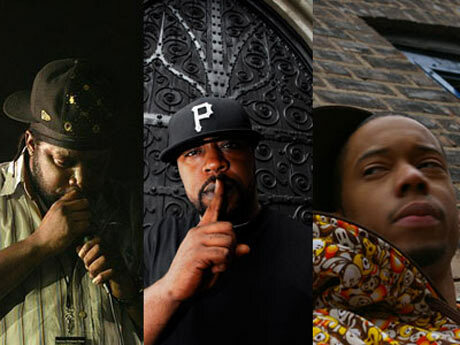 When it comes to underground hip-hop, producer Black Milk and rappers Guilty Simpson and Sean Price are among the best. So the announcement that they're collaborating under the collective name Random Axe pretty much begs the title of supergroup. AllHipHop.com reports that the trio have signed a deal with rapidly growing rap powerhouse Duck Down. In a statement, label head Dru Ha expressed his high hopes for the trio, stating, "It's an exciting time for Duck Down with all of these new signings and upcoming releases. There are never too many Sean Price projects for us and combining his powers with Guilty and Black Milk makes for a formidable unit. Black's production is earth-quaking: from his drums to his sample game to his ability to play and arrange live music. His vision to craft a song and skills on the mic should be taken note of. I can't wait to see where he takes this project with Sean and Guilty." While no release date, or album title, has been set, the label expects the Random Axe record to drop by year's end.